Spot LNG prices for east Asia and Europe climbed higher across the past month as the key buyers in the two regions moved further into winter, with gas supply problems in Europe providing a sharp boost higher towards the end of the period. Spot LNG prices for South America, however, held fairly steady, with the southern hemisphere having entered summer, when heating demand is lower, and with Brazil’s rainfall situation looking set to provide sufficient hydropower potential. The ICIS January East Asia Index (EAX) opened the period at $9.675/MMBtu on 16 November and climbed to $10.750/MMBtu by the end on 15 December. It averaged at $9.956/MMBtu over the month, up by 8% from the month before and by 29% from the same period the year before. 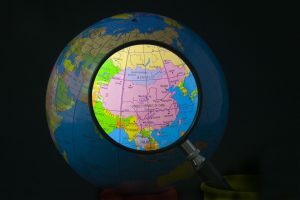 While major buyers such as South Korea’s KOGAS and China’s CNOOC had already lined up lots of supply for the winter in recent short-term deals, there was still some additional spot market interest in the region from parties including CNOOC, Petrochina and Taiwan’s CPC, while they were also competing for near-term cargoes against demand from Indian companies including Bharat Petroleum, GAIL and GSPC. Meanwhile, Indonesia’s Bontang production plant suffered some reduced output as it worked to fix an issue with an LPG injection tank. 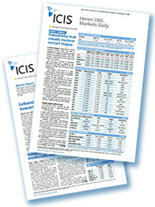 The ICIS Northwest Europe Index (NEX) rose from $6.558/MMBtu at the start of the month to $7.426/MMBtu by the end, averaging at $7.078/MMBtu across the month as a whole. Major infrastructure problems affecting supply to Europe’s domestic gas markets pushed spot gas prices in Europe’s onshore gas markets sharply higher in the week from 11 December. This in turn boosted European LNG indicators and fed through to increased bullishness in Asia, which needs to compete against Europe to secure LNG. The North Sea Forties oil pipeline was shut down for urgent repairs, bringing immediate reductions in gas production from fields such as Britannia, Elgin-Franklin and Shearwater that send gas to the UK through dedicated gas pipelines, but export their liquids production through Forties. The situation was compounded by cold weather, an outage at Norway’s Troll gas field and, in southern Europe, an explosion affecting the Austrian gas network, which brought reductions to the key Baumgarten transit point for Russian gas flows to western European countries such as Italy. The South America Index (SAX), meanwhile, opened the month at $8.917/MMBtu and closed unchanged at $8.917/MMBtu, averaging at $8.853/MMBtu across the period. The Forties outage and other problems sent UK gas higher, but the East Asia Index responded to ensure the region remained attractive for LNG. On 12 December UK NBP gas for same-day delivery traded as high as 99 pence/therm (around $13.25/MMBtu), day-ahead gas for next-day delivery traded up to 88.40 p/th (around $11.85/MMBtu), and January hit 73.50 p/th (around $9.80/MMBtu). These were levels that exceeded Asia for immediate delivery, and would also be attractive for January delivery for cargoes that originated in the Atlantic Basin. However, such high prices do not necessarily guarantee that spot LNG cargoes would be drawn into the market. It would be hard to deliver an LNG cargo fast enough to meet within-day or day-ahead needs, unless the ship were already offshore a terminal. The highest-priced trades also often occur in small volumes, and those prices might not be sustainable across the volume needed to market an entire LNG cargo. A typical 150,000cbm vessel carries around 90 million cubic metres of pipeline gas, enough to meet maybe a quarter of daily cold weather demand in the UK as a whole, and a volume equivalent to over 1,300 standard size (25,000 therm) daily trades or some 42 January trades. UK NBP gas for January closed 12 December at 66.375 p/th (around $8.90/MMBtu), falling back some 90 cents from its peak during the day, and closed on 14 December at 61.963 p/th (around $8.34/MMBtu). The EAX January price, meanwhile, had surged to $10.75/MMBtu by 15 January, placing it some $2.40/MMBtu above the UK NBP. With shipping costs from Europe to Japan indicated at a little over a dollar per MMBtu, the reactive strength of Asian prices means it could still be profitable to reload LNG volumes out of Europe and take them to east Asia, despite the security of supply concerns in the UK. The NEX index did not rise as high as the UK NBP gas market. This is because the NEX represents deliveries to northwest Europe as a whole, including the Netherlands, Belgium and France, where prices did not move up as sharply as in the UK. Continental European pipeline markets have closer access to large storage facilities to smooth their prices over winter, whereas the UK’s main gas storage facility at Rough is being shut down. One cargo that did seem to be on course towards the UK was the first product of Russia’s new 5.5 million tonnes per annum Yamal LNG plant, aboard the 172,000cbm Christophe de Margerie. The cargo was sold in the spot market by Yamal LNG partners to Petronas LNG UK, and was indicated to be heading to the UK’s Isle of Grain terminal for a 28 December delivery. The first cargo had initially been expected to be sent to China, but the onset of winter may have led the Yamal developers to prefer to send the shipment west to Europe rather than attempt the Northern Sea Route through the Arctic Circle to east Asia. Volumes from Yamal LNG could still ultimately reach Asia from Europe, however, if they are switched from ship-to-ship in Europe, or reloaded from terminal tanks back onto another ship. The start-up of the next major LNG plant to enter the market seems slightly delayed, however. The first 5.25 mtpa train at the US Cove Point facility had been expected to begin producing LNG in November and to produce its first cargo by the end of 2017, but market sources thought the first loading was set to slip into 2018. Flows of feedgas into the plant from US onshore pipeline gas systems did not seem at high enough levels to indicate full-scale production of LNG was yet underway. Also suffering delays was the start-up of Pakistan’s second floating gas storage and regasification unit at Port Qasim. Cargoes that had been expected to be delivered to the port aboard the 174,000cbm Gaslog Greeceand the 160,000cbm Maran Gas Lindos were deferred, with the ships diverting from Pakistan to head for destinations further east. 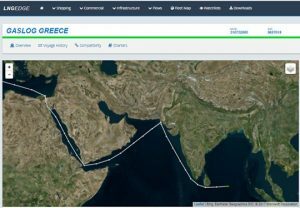 LNG Edge shows the 174,000cbm Gaslog Greece initially heading into Pakistan’s Port Qasim, then diverting away to instead deliver its cargo further east. Other floating storage and regasification units have also been moving into position in recent weeks. The 263,000cbm MOL FSRU Challenger, which was originally intended for use offshore Uruguay, has been chartered for use in Turkey in the near-term. It left Aliaga, Turkey on 18 November and is now located just offshore Dortyol, Turkey, where it will take up a position to receive future deliveries into the southeast of the country. 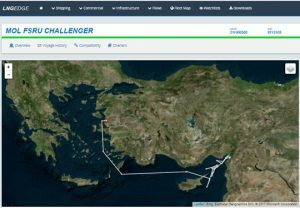 LNG Edge shows the 263,000cbm MOL FSRU Challenger arriving offshore Dortyol, Turkey. Meanwhile, Brazil’s Petrobras has chartered the 138,000cbm Golar Winter to return as the country’s second FSRU. The ship left Ferrol in Spain, where it had been in dry-dock, on 21 November and crossed the Atlantic, initially arriving at Pecem, Brazil on 3 December. It then moved south from Pecem to take up a position at Salvador, Brazil on 10 December.